JOHANNESBURG (AP) — The head of Africa's continental body did not get to an Ebola-hit country until last week — months after alarm bells first rang and nearly 5,000 deaths later. Pledges to deploy 2,000 African health workers have remained largely that — promises. No African countries are on the United Nations list of contributors to fight the epidemic. The E-word did not even figure on the agenda of a session on peace and security at the Pan-African Parliament in South Africa last week — more than a month after the U.N. Security Council declared the Ebola outbreak a "threat to international peace and security." Angry legislators from Sierra Leone and Liberia got up to protest. "They said as far as they are concerned, nobody wants to talk about Ebola," said Jeggan Grey-Johnson, a governance expert who watched the session. "They said countries like Liberia feel totally abandoned by the rest of Africa and shut off from the rest of the continent," he told The Associated Press. With few exceptions, African governments and institutions are offering only marginal support as the continent faces its most deadly threat in years, once again depending on the international community to save them. 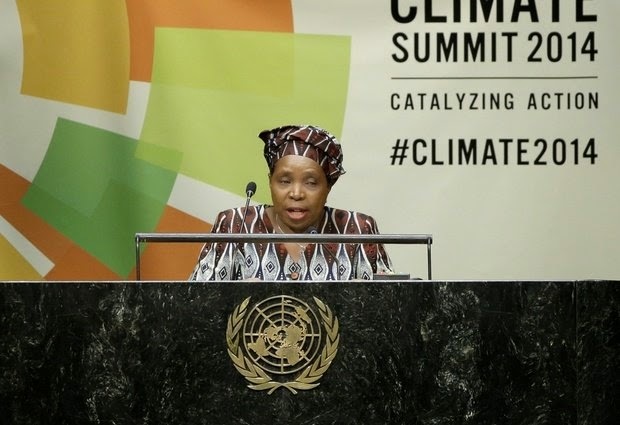 Ebola "caught us by surprise," the chairwoman of the 53-nation African Union, Nkosazana Dlamini-Zuma, said this week at a meeting with the U.N. secretary-general and the World Bank president in Ethiopia. "With the wisdom of hindsight, our responses at all levels - continental, global and national - were slow, and often knee-jerk reactions that did not always help," she said. She is a medical doctor from South Africa, where mining magnate Patrice Motsepe Tuesday announced he has donated $1 million to the fight against Ebola in Guinea, where the outbreak started. Motsepe's gift, the largest donation by far from any African individual, came after the World Food Program lashed out at China's billionaires, saying their contributions lagged behind their companies' huge economic interests in the mineral-rich region. Motsepe's office said his company has no interests in any of the countries where Ebola is raging out of control — Guinea, Sierra Leone and Liberia. China's government has sent many health workers and given more than $8 million with a promise of $6 million more to the U.N. Ebola fund. "Ebola is first and foremost our problem," the president of the African Development Bank, Donald Kaberuka, told a business forum in Brussels this month. "Before relying on international aid, we must first encourage Africans to take action." The African Development Bank is the second largest institutional contributor to the U.N. fund to fight Ebola, second only to the World Bank, having given $45.4 million and promised another $17.4 million. In addition it has given loans and grants individually to the most affected countries. By contrast, the African Union has made an "uncommitted pledge" of just $700,000. Africa's equivalent of the Organization of America States, it is the body many believe should have taken the lead from the start. No finger has been pointed at the Africans, even as rich countries have blamed each other for delays in responding to the crisis and the lack of financing. WHO chief Margaret Chan has said that governments have the first responsibility for taking care of their citizens, including in West Africa. The WHO identified the first Ebola case in Guinea on March 21; on March 30 the virus crossed the border into Liberia; Sierra Leone reported its first two cases on May 30. On June 20, with some 330 recorded deaths, Doctors Without Borders warned that the outbreak was "totally out of control." But he said they still need to know "when the first of these pledges will materialize." Those promised volunteers are only a tiny fraction of the number needed to stem the outbreak. The European Union said this week it is looking to put 40,000 local and European workers into place in the affected countries. Uganda and Congo, which both have experienced Ebola outbreaks in the past, already have medical teams deployed in Liberia, under contract to WHO and not funded by their governments. It is difficult to say how many Africans are deployed on the front lines of the Ebola battle. In Uganda, Dr. Anthony Mbonye, the commissioner for community health services at Uganda's Health Ministry, said he believes up to 40 Ugandan health workers are on the ground but that most traveled privately. He said the Ministry of Health had officially approved the deployment of about 10 doctors to Sierra Leone, Liberia and Guinea. The continental body's lack of a robust response "showed the fragility of our African Union, so heavily dependent on the international community to rescue us from catastrophe," said Isata Kabia, a Sierra Leonean legislator at the Pan-African Parliament. "We cannot blame the WHO for their lack of knowledge; we can't blame the EU for lack of interest," she told The Associated. "But I think the AU should not only have led the response but also the requests to the international community." Associated Press writer Rodney Muhumuza contributed to this report from Kampala, Uganda, and AP medical writer Maria Cheng contributed from London.